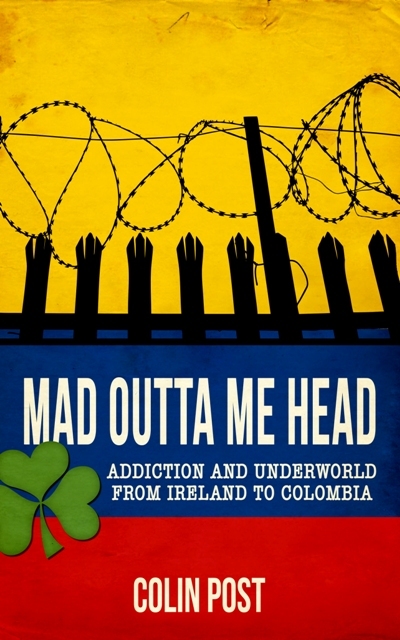 Mad Outta Me Head follows the life of Christopher Kavanagh, originally known on this blog as “The Mick,” and his love of drugs and alcohol — getting “mad outta his head.” From Ireland’s industrial schools and penitentiaries to the heroin epidemic in Ireland, Christopher paints a vivid picture of Dublin’s underworld in the 1970s and 80s. 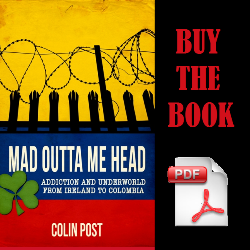 His drug addiction brought him to Colombia, where he served three years in Bogota’s largest prison, La Modelo. In 1989, Christopher was released onto the streets of Bogota at a time when TIME Magazine called it the world’s worst city, the capital of the world’s most dangerous country. Or buy it on Amazon. 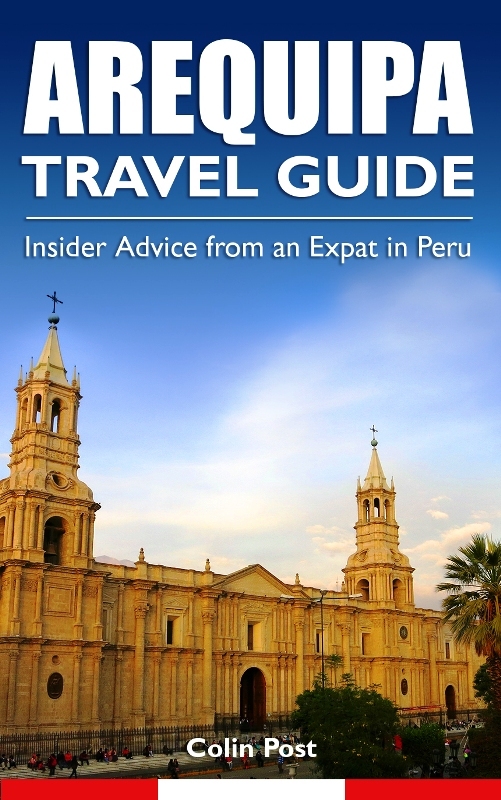 Amazon’s bestselling guidebook for Lima, Peru. Points of differentiation from standard travel guides are the off-the-beaten-path options, walking tours with detailed instructions and links to the routes on Google Maps. An entire chapter is devoted to Peru’s leading gastronomy, which profiles typical dishes and reviews the best restaurants in Lima. Whether you stay in Lima for one day or one year, this guide will enhance your stay in the City of Kings. You’re lucky I lived in AQP for a couple years, because nobody else is going to write a travel guide for this small city of 1 million. 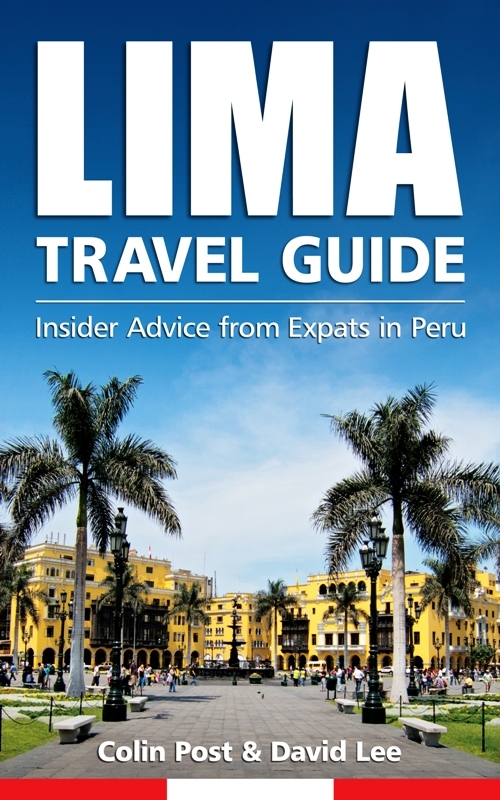 Like the Lima guide, includes must-see destinations, off-the-beaten-path options and a walking tour with detailed instructions and maps. An entire chapter is devoted to Arequipa’s gastronomy, which is hard to find anywhere else. In fact, eating is the most important thing to do in Arequipa. The book includes profiles of the top local dishes and reviews of the best restaurants in Arequipa. Whether you stay in Arequipa for one day or one year, you will find this guide enhances your stay in the White City (La Ciudad Blanca). Sucker Free is an actionable program to build the skills to fight anybody, and to stop being afraid. After almost 20 years of trial and error in different sports and training programs, I have identified the fastest and most efficient path to becoming truly “bully-proof.” This book is an introduction to the most effective self-defense principles for people who are starting from square one. Zero experience. Zero knockouts. Zero idea where to begin. If you follow this program, you will never worry about being bullied again. I wrote it with myself in mind, myself as an 18-year-old weakling facing three years in prison. This is the program I would put myself on if I could travel back in time. None of these books up your alley? You can support me by buying products from my line of herbal supplements and natural foods. Keeping this business alive ensures I’m independent and uninhibited to do what I do on this blog. Click the images for more information on the Peruvian Naturals website. Or buy from the Peruvian Naturals storefront on Amazon. Or ebay, Amazon UK, Amazon DE, Amazon FR or Amazon ES. If you buy from Amazon, please leave a review!